"Just Gotta Go before it's burned down, locked up, sold off or destroyed." We've used that mantra for more than 20 years. The scope and scale of change seems so much more profound with each passing year. Prior to leaving for our Glacier-Waterton trip, we "almost" talked ourselves out of going because of the fire smoke issues. At one point we actually said, "It's going to be too smokey, let's call it off." But then we remember our mantra and looked at each other simple said, "Just Gotta Go." And now we're go glad and grateful that we did. So much has already changed in the few short weeks since that trip. The Sprague Fire in Glacier National Park burned down Spreey Chalet and has wrecked havoc with the Lake McDonaald Lodge area along the Going to The Sun Road. We were able to see this beautiful ocne pristine area before it mostly went to black. 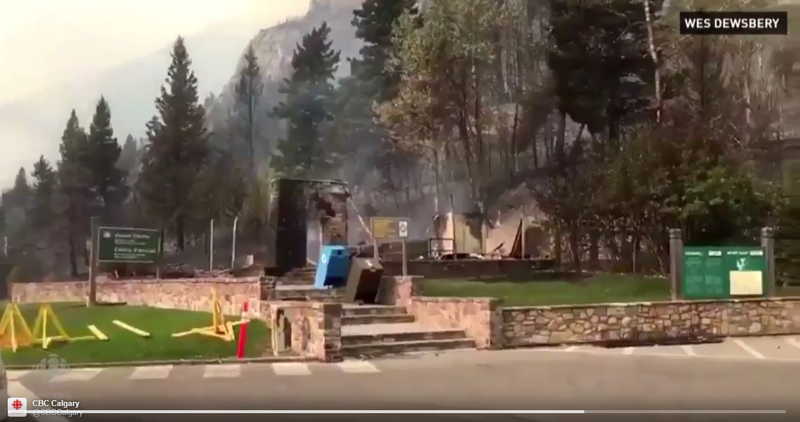 Meanwhile, fire has hit Waterton even harder. The photo you see above is all that's left of the Waterton Visitor Center. This structure sat right on the edge of Waterton and we passed it many times during our stay here. We often used the parking lot of make u-turns. It can't be more than a quarter mile from that epic landmark, The Prince of Wales Hotel. Reports seem to indicate that the fire burned right to the edge of Waterton in other areas, too. That beautiful forest surrounding Waterton now appears to be mostly or totally gone. Ditto with the forest on the way out to that nearby glacial lake. It's hard to imagine what it must look like there now. We are so fortunate to have been able to see it during its last season of splendor. That's why sometimes ya have to ignore the superficial stuff. So happy we remembered "Just Gotta Go!" Click the image to get geeky. 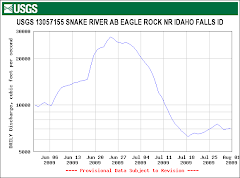 Click graph to see current flow.